People without health insurance are 40 percent more likely to die than those with private insurance, according to a new study whose authors say the finding underscores the need to expand coverage to the 46 million who lack it. WASHINGTON — People without health insurance are 40 percent more likely to die than those with private insurance, according to a new study whose authors say the finding underscores the need to expand coverage to the 46 million who lack it. According to the report, published today in the Journal of Public Health, lack of health insurance was a factor in the death of as many as 45,000 people in 2005. Researchers lead by Dr. Andrew Wilper, of the Cambridge Health Alliance, an affiliate of Harvard Medical School, conducted a survival analysis of data from 9,000 adults under the age of 64 who were enrolled in the Third National Health and Nutrition Examination Survey (NHANES III). Participants in the survey, which ran from 1986 through 1994, were asked questions about insurance, health status, income, and education, among other things, and were examined by a physician. Among the 9,000 participants, about 16 percent were uninsured. People who were young, minorities, smokers, and had less education and income were more likely to be uninsured (P=0.01 for all comparisons). For the current study, researchers looked at the number of people enrolled in NHANES III who had died by 2000 and determined about 3 percent of the participants were dead. After adjusting for factors such as obesity, exercise habits, alcohol use, and smoking status, researchers determined those without insurance were 40 percent more likely to die than those with a private insurance plan. Researchers excluded those on Medicare or Medicaid from their analyses. Among the other factors that increased the risk of death were clinically-verified poor health (222 percent), smoking (102 percent), being a former smoker (42 percent), and being a male (40 percent). So, while other factors clearly make a person more likely to die, the new finding suggests that being uninsured is more hazardous to the health than previously thought. In fact, the risk factor is 2.5 times higher than a 2002 estimate from the Institute of Medicine (IOM), which that suggested about 18,000 people between the ages of 25 and 64 die per year because of lack of health insurance. 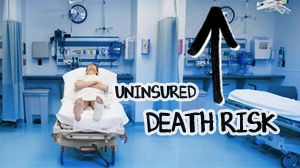 The study's authors said previous investigations have shown that the uninsured are more likely to go without needed care, which could make them more likely to die than their insured counterparts. Also, uninsured people are more likely to use emergency rooms, indicating that a decision not to treat a preventable illness might stem from not having insurance. The IOM has said that having insurance improves health because it allows people to get medical care when they need it, to have a regular source of care, and to have continuity of coverage. The authors also said the increased risk of death attributable to lack of insurance suggests that alternative measures of medical care for uninsured people, such as community health centers, do not protect against fatal medical issues as effectively as private health insurance. "Despite widespread acknowledgment that enacting universal coverage would be life saving, doing so remains politically thorny," the study authors said. "Now that health reform is again on the political agenda, health professionals have the opportunity to advocate universal coverage." The leading Senate healthcare reform plan — from Sen. Max Baucus (D-Mont.) — would cover about 90 percent of the uninsured, the senator said. Baucus is the ranking member of the Finance Committee. The study's authors pointed out several limitations. One is that data was collected at a single-point, so that investigators would not know if an uninsured person became insured later on. However, the authors point out that if a person is uninsured at a specific point, he is likely to be part of a group of people who are uninsured over the long term. +Proposed Soda Tax: Pop Hit or Total Fizzle?